I’ve talked with many ex-smokers who have said that even though they quit, that craving never goes away. I think of this because most of my marathon thoughts have to do with the first one I ever ran which was back in 1994. I didn’t train and basically walked my 2nd marathon in 2004 so there wasn’t much in the way of opportunities to form many indelible memories. 1994 is entirely different …memories of the training, memories of the run. Maybe it was back in ’94 when I became addicted and even though I’ve been an ex-runner more of a runner over the last 20 years, just like the ex-smoker – that craving from running never goes away. There is a local park with a 1.5 mile track and markers every 0.1 miles. I remember the first time being able to run completely around that track without stopping. It was also at that track, after deviating off the path for a while then coming back that I ran my first hour non-stop. I remember wanting to know what it was like to run at a 4 min/mile pace like Roger Banister so, I figured that was 15mph and was actually able to bury that speed …for 0.2 miles anyway. For me, that pace was just shy of an all out sprint and took place about two weeks before my first marathon. I remember one of my last long runs. I went out the night before with a can of white spray paint and a car full of water bottles. The run started at the water tower of a local mall and ended at a VFW post & campsite with a lake about 15 miles away. I drove that course and stopped my car every mile, then got out and spray painted the mile number on the road and left a couple of bottles of water next to the number. I remember at mile 13 one of the water bottles had tipped over and emptied out. It was rough looking forward to water only to find none. My car was waiting at the parking lot of the VFW post and a kind elderly couple who lived at the site gave us some water and a bite to eat. The run itself was great up until the 20 mile marker, up to that point it was pure running. Whatever family lived around the 20 mile marker had tables set up out front with food, it was the first time I stopped running and grabbed some food to eat – I think I stopped, not positive about that part, I am positive I ate food and very shortly thereafter my legs stopped working. It’s like they seized up and wouldn’t function properly. I was afraid I might be out of the race but, I found if I squatted down then stood back up that was enough to get my legs moving again, at least for a block or two then I would have to squat down, stand up and continue jogging. That went on for most of the remaining 10k of the race. I’m guessing my pace was somewhere between 10 and 11 minutes per mile. I’d like to beat all that. It’s what I think about. I know I mentioned things I need to do for karate, masons, getting my chiropractic license but, the one thing that seems to dominate my mind more than anything is being able to run longer and faster. I want to be able to hit those milestones I did 20 years ago. I want to run around that track at the park non-stop. I want to run for an hour non-stop again. I want to best that 4 minute per mile pace, even if it is just for 0.2 miles. Ever since high school, I’ve wanted to run a quarter mile in under a minute. I think, if I was on a regular track then I may have been capable of doing it that day I toyed with that 4min/mile pace. My best mile time in high school was 6:04 so I would love to break that 6 minute mark. I was a lineman on the football team back then so, it was the fastest time of the linemen but beating that 6 minute mark was something that was needed to get an extra star on our helmet. Some thoughts in my head are positive about the training and my ability to be able to complete the upcoming marathon while other thoughts lend themselves to doubt. 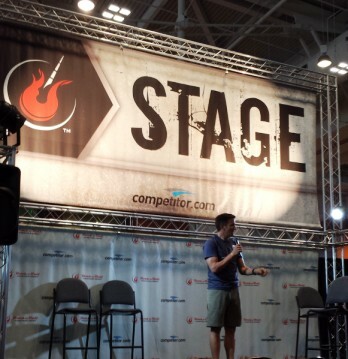 I like that I still have over 6 months to train for the event but, when I look at the numbers – only 186 days away – 185 days away in about 15 minutes and realize how much farther I have to go then I wonder…. I like that my pace at Nashville was 14:41 because it looks like it’s within striking distance of that 10 min/mile pace. I know when I’m actually running that my pace is better than 6 mph but, I can’t keep it up that long – that time is still being measured in minutes…. There is a race in three weeks, May 17th I’m looking into. They have a half marathon with a 3 hour time limit but, I’m not really cut out for accomplishing anything overly noble in those half marathon runs and was thinking of tackling a 10k while still adhering to my 5 minute interval program but, maybe pushing it a little bit and maybe doubling the amount of time i was running in Nashville. Maybe 1.5 or 2 minutes of running every 5 minutes. 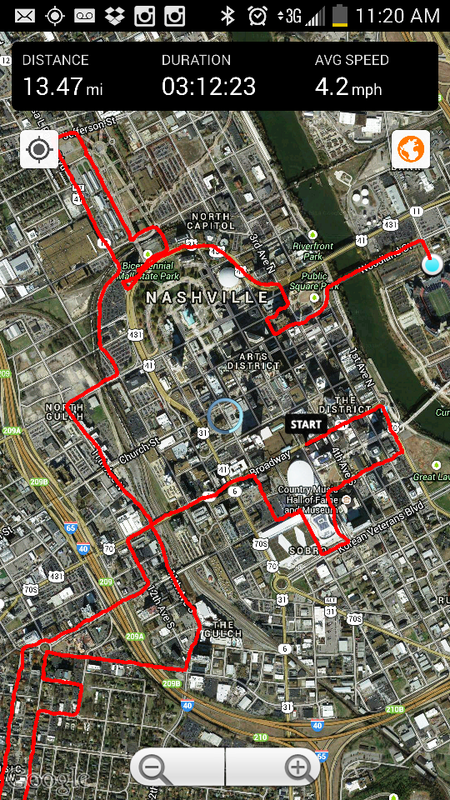 I have times of 1:29:33 and 1:30:19 for the 10k splits in the Lincoln Presidential and Nashville CMM runs respectively. Maybe I could take 8 minutes off those times? I’ve noticed this phenomenon before though. When I’m doing well, I want to do better. But then upon trying or wanting to do more and specifically after writing it down, it seems …more often than not, that’s when I’ll fall apart a little bit on those very things I said I wanted. Idk – (that’s “I don’t know” for you non-texting type people out there) Today, I was just exhausted. I added a few more lawns to be cut today than I originally had on my schedule so, from 9:02 this morning until 4:10 this afternoon I was cutting grass and except for one quick stop at a local gas station to use the restroom and my drive time from one job to another, that’s pretty much what I did all day – cut lawns. According to my fitbit that I wear on my wrist I covered over 12 miles today and today was an OFF day for training. I’m just currently exhausted and at 7:30, instead of being at karate, I found myself in bed only to wake 3 hours later dying of thirst. Since waking I’ve had 1/2 dozen strawberries, 1 orange and 3 bottles of water in addition to writing a few pages here. I’m thinking the moon would be what I’m shooting for, that marathon run on November 1st down in Wynne, Arkansas but, the stars would be things like running that 1.5 mile path non-stop – being able to run fast – running for an hour non-stop and I do have a half marathon I’ll be doing with my brother about two weeks prior to my marathon attempt. He mainly runs for fitness and doesn’t do too many organized events but we keep each other abreast of our training and I know he’ll knock out 3 or 4 miles at around a 9:17 pace and he’s already picked out a training program so he should do *very* well in his third ever half marathon. It’s the St Louis Rock n Roll Half Marathon, I think on Sunday, Oct 19th – two weeks before my marathon run. But, if I can run that half in 2:25 or less then I will also qualify for the Pikes Peak Ascent (wave 2, i think) in 2015. Gotta finish that Ascent in 6 hours or it’s like you never existed. And, finishing that event in 6 hours or less is the only way to get a finishers jacket. I want one of those jackets. It’s kind of like getting one of those Boston Athletic Association jackets that you might see one or two people wearing at any big event. I guess the moral of this story is that I can’t be afraid of failing or falling short of my goal because there is so much sweet fruit to be had along the way. I can not use the possibility of failing be any type of excuse for not trying. I didn’t even like writing that last sentence. If I take my training seriously then I may be entitled to serious results. I spent a great deal of time during my drive down to Tennessee thinking about the whole concept of being serious and thereby taking responsibility for the results we obtain in life. That’s a whole other blog I was thinking about writing. Anyway, so far so good with the current training. I remember back in the Summer of ’94 I took a running class offered at a local university which met 3 days per week, Monday, Wednesdays and Fridays at 6 a.m. I ended up entering my first 10k that Summer and a few months later completed that first marathon of mine. So, I know it’s possible to complete a marathon with less than 26 weeks of training but that was 20 years ago also and I have a more vintage body to do this with. I wasn’t sure where to start so I threw some pictures up that I had shrunk down after the run. The first picture on the left is from an Instagram user called @12thbraod. I was beyond the horizon in that picture. I think coral #23 was around the top of that hill, I was in #37 out of 40. The time I got in this half was 7:55 faster than the Lincoln Presidential Half Marathon (LPHM) I ran on April 5th. The really cool part was the 6.9 miles after the 10k split. I was actually slower on the first 10k of the Nashville run but 8 minutes and 41 seconds faster on the remaining 6.9 miles. I stuck with doing my five minute run/walk intervals throughout the entire race but, instead of only doing 6 five minute intervals like I did today in training, I did 38 five minute intervals, the majority of them consisted of 0:40 seconds of running followed by 4:20 walking. It was pretty cool because most everyone else was walking the last half of the race and I kept breaking into those 40 second runs and passing people, lots of people and I was able to keep doing it all the way to the end. During the LPHM I ran very little except for the last 0.1 miles at the end and barely made it across the finish line. 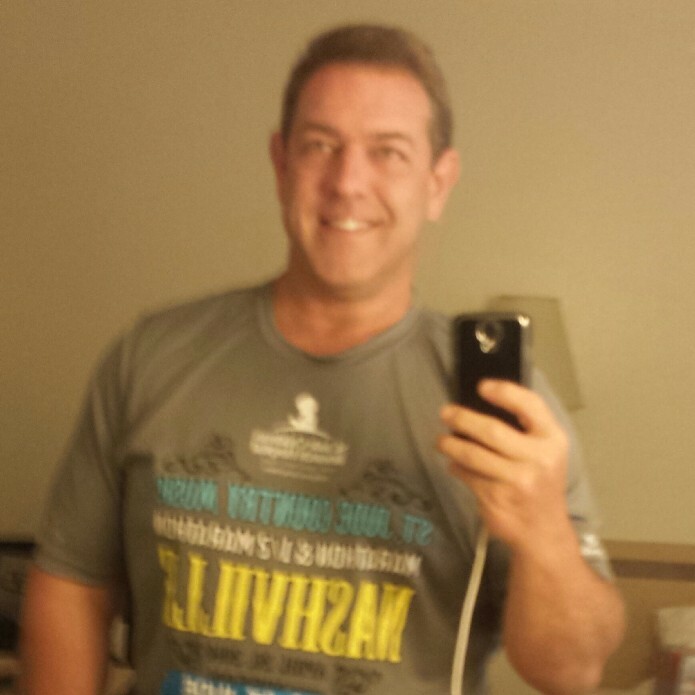 My legs seized up and had to hobble over to the medical tent where they iced up my anterior quads proximal to my knees but, I got to walk proudly after the Nashville run 🙂 The selfie I took below was around 4:30 or 5 a.m. at a Motel 6 up in Goodlettesville. I was a little surprised at having $10 tax added on to a $44 room since that equates to a 22.7% tax. The nice lady who checked me in said everybody got their cut in that area but they use the money for good. After looking around the area I would have to agree since everything was so neat and clean. 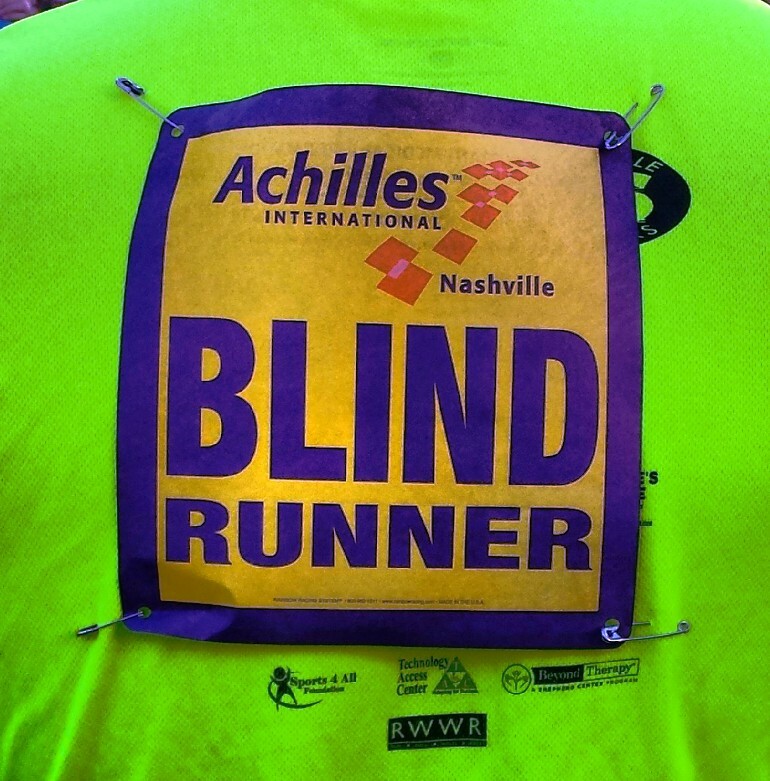 There were a couple of blind runners in the corral right in front of me which I had never seen before. Below is a post race selfie, and one of the many groups of people who cheered along the route. The mile marker 9 was interesting because when I originally took the picture I didn’t notice the girl in the picture much less the fact that she only had one leg. 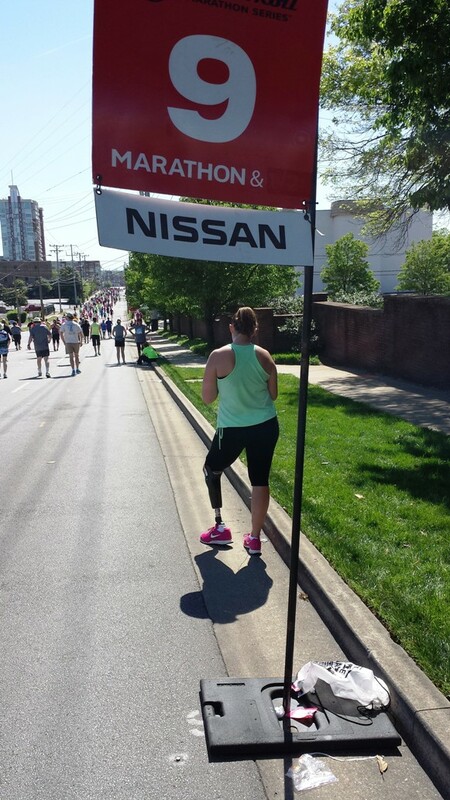 I think the Nashville CMM is probably one of the best races for people running in their first half marathon since there are so many people. I was never without a crowd of people around throughout the entire race and that usually doesn’t happen. I also found some other really cool runners. One guy here on wordpress writes a blog called http://runninglarge.wordpress.com/ and he’s a 235 pounder with some really great times. One of his last half marathon times I read about was 2:12 and that may have been for the Midsouth Championship run down in Wynne Arkansas last year. Basically, my half marathon time minus an hour which means this guy is running around 10 minute miles. That’s kind of a goal of mine. I know if I can run 10 minute miles then I can hit a marathon time of 4:22:00 and, if I can run 9:55 per mile then I believe I would come in under 4:20 which would be really cool. I know I have a book in the other room is devoted to running a sub 4 hour marathon and I might look at it but, for right now, I think I have a smart program which will help keep me from any overtraining and possibly injuring myself. I just need to stick to it and be patient. That 235 lb guy is really inspiration to me. It really helps give some extra value and something tangible to shoot for while continuing to drop weight. Which reminds me, I still need to get my weight posted. 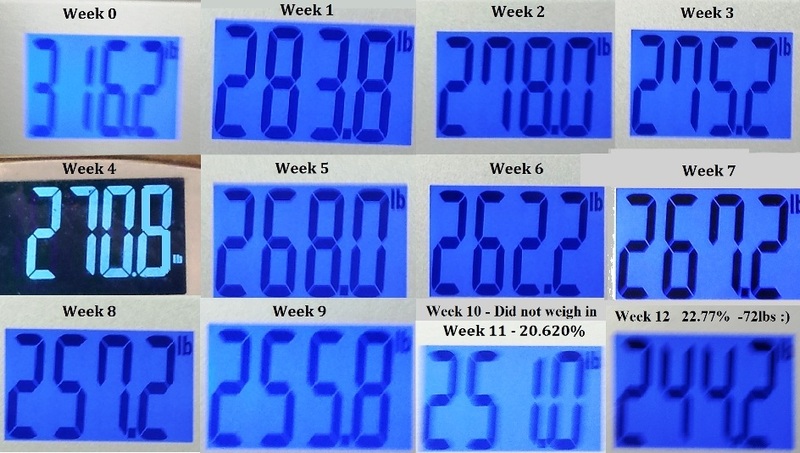 During the 12 week contest when I dropped 72 pounds, I took a picture of the scale at each weekly weigh in then cropped out the weight and kept track of my weight each week and made like a collage which I used as wallpaper on my computer. yeah – hmmm. anyway, what’s above was my wallpaper and it helped to keep me on track. I think I only had one weight gain in week 7 of 5 pounds but dropped 10 the following week. I did another initial weigh to start another 12 week session on my own a couple weeks ago and was at 260 lbs which, is about where I figured I would end up. The following week I was at 262.8 which is an increase of a little over 1%. and a weight check after running Nashville was 254 but mainly due to dehydration. I believe I was 258 this morning. I need to get my new wallpaper up and posted here since I don’t have a contest to help motivate me and I still need to drop some weight. I was thinking of a 20-25 weight drop during this second 12 week session which should put me below 240. It was hot in Nashville. In most previous runs I might grab a cup of water and it could take me the next 1/2 mile to drink it all. At Nashville it got to the point where I was grabbing two cups of Gatorade at a time, slamming them both then grabbing two more. I think there were stops when I drank 5 or 6 cups total and did that several times. When I first started that contest, I used MyFitnessPal.com to help track everything I ate. I need to do that again. I’m mainly cutting a lot of lawns right now to get money to pay my bills and I know a week before this last run I had one day that I cut so much grass that my daily walking total was over 15 miles. That may have included a training run but my runs are no more than 2-3 miles right now, even with a 20 minute warmup. I’ll need to regain control of the eating situation and post those weekly weigh-ins to help hold myself accountable. Oh, John Bingham was another person who spoke at the stage at the Nashville Expo, he goes by the nickname The Penguin and I had read some of his stuff before. Once I pass Part III boards I can get a license in Illinois but, I think I’ll be following in my brother’s footsteps and probably have to retake that exam in September. March scores don’t come out until May so, we’ll see. I really need to get a training program together for studying. I was thinking I should be studying at least as much as I’m running, maybe twice as much. I’ll definitely need to put more effort into it than last time and it’s not like the effort was slight. I went to 10 days worth of board reviews and most days those reviews were 10 hours long but, it’s one thing to be exposed to the material and another thing to have it all memorized. I did learn a lot and have a much better idea of what it will take to pass Part III. Other than that, I’d like to do more with my karate as well. I’m closing in on that black belt rank and need to practice katas and a few other things more often than just in class. You have to get comfortable being uncomfortable. This may be a tenet for life and living. 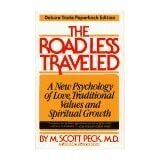 It reminded me of a book called The Road Less Traveled by M. Scott Peck, MD. I have a few copies of that book and, in the past, I know I’ve read the first few pages literally dozens and dozens of times. I believe the first words in that book are “Life is Difficult” There’s also an asterisk right after that which refers to Budda and suffering… but, the gist is that once we can accept that life is difficult then we can transcend that fact. Anyway, the first thing Kevin said was to get comfortable being uncomfortable. “What story do you want to write?” Here Kevin was talking about the story you would tell after finishing your marathon. He said the average person would have between 3 and 1,000 self conversations about the run once they are finished and he challenged people to think ahead of time about what kind of story they wanted to write. Do you want to write a story that says you walked at each water station or that you kept running right through them? This made me think of that poem by Walt Whitman, O Me! O Life! which was also used in the movie, The Dead Poet’s Society – “that the powerful play goes on, and you may contribute a verse” What will your verse be? WIN against those voices in your head. 73 year old Don Write – Multiple Myeloma – Running his 81st Marathon Tomorrow! Don Write is pictured above, he ran his first marathon in 2002 after his 60th birthday! 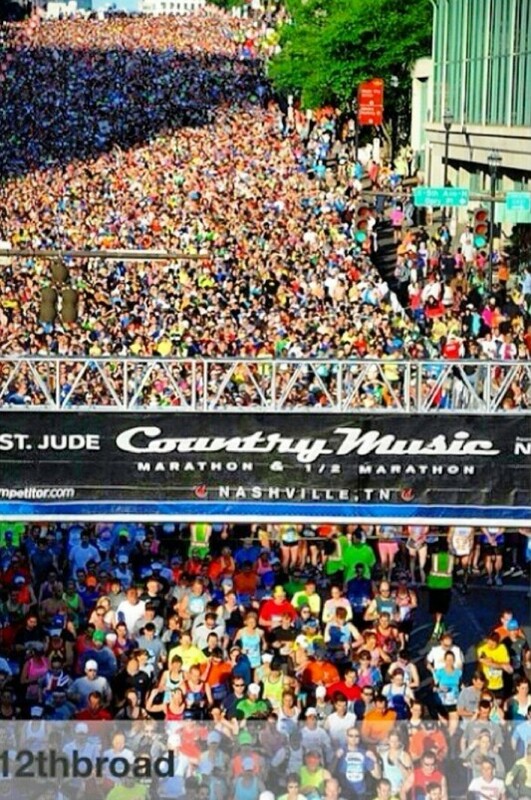 Tomorrow at the Country Music Marathon Don will be running in his 81st marathon at the age of 73! 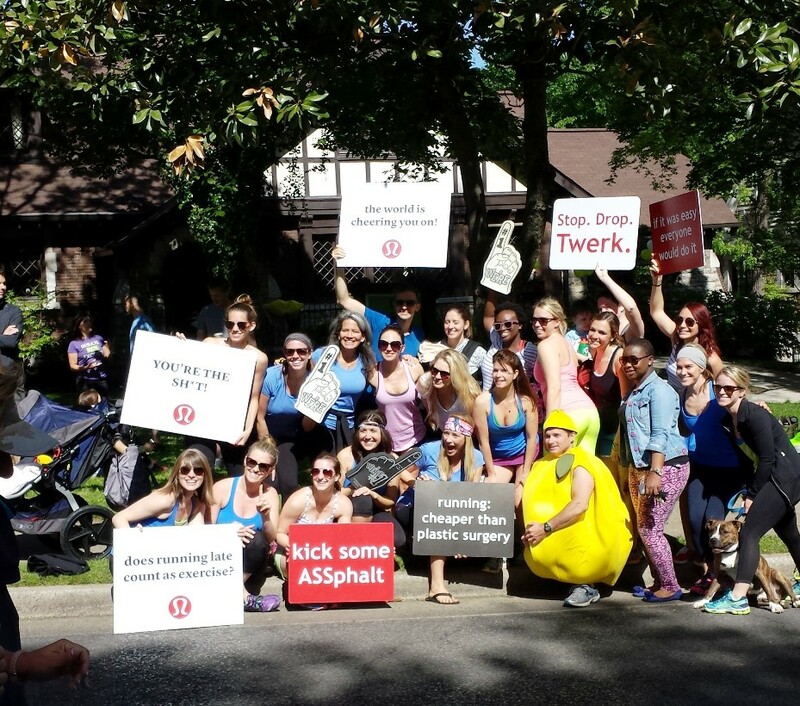 Two weeks after he ran his first marathon Don was diagnosed with Multiple Myeloma (MM) – ….this is where my brain goes off in tangents since MM is one of the things we cover a lot for our board exams. If anyone is reading this….idk, …there’s still docs out there that rely on the presence of Bence Jones proteins to dx MM but I have read (and learned in school) that Bence Jones has about a 40% accuracy while electroimmunophoresis is accurate about 92% of the time. Look for an M spike in the IgG …if i recall correctly. MM – like MnM’s (the candy) – all the same size, as are the punched out lesions in the skull visible on x-ray. I think Don mentioned on the news tonight that the mean survival rate is about 5 years with MM, I really don’t remember but, he’s more than doubled that estimate. This place is pretty incredible. It’s a very clean city. I had thoughts of heading over to Memphis tomorrow night but keep hearing bad reviews about the place. My main intention was to get over to Wynne, Arkansas to see where I’ll be running the upcoming marathon on November 1st. However….just because Nashville and Memphis are in the same state and Wynne is just west of Nashville, it’s still a 4+ hour drive to get to either location. …I wouldn’t mind staying in Nashville an extra night but, with fiduciary responsibilities being what they are I might have to jet back home tomorrow after the run. Yikes! It’s after 10:30 and I need to be getting up at least by 4 so I can head back to the city and find some parking. Not sure if I mentioned this before but there are over 30,000 people signed up for this run tomorrow. I’ve done some other Rock n Roll type half marathons in the past but never quite as big as this one. I’ll be starting out in the 35th corral (out of 40) and, even that was with a pretty optimistic time of 3 hours. Castlerock State Park is located around the Southwest corner of St Louis county. 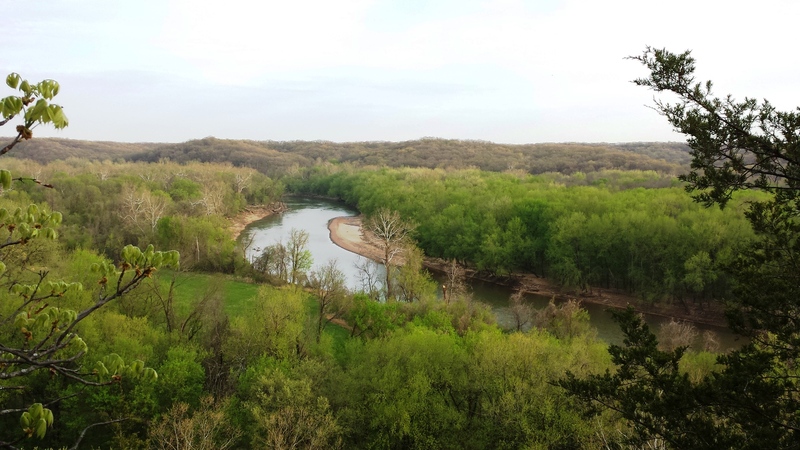 What’s amazing about this place is that it’s only about a mile from civilization but, once you’re there and hike up the canyon you can see for miles but don’t see a speck of civilization, just nature, green and the Meramec River. I thought I was close to the park when I finished up my last job and since I procrastinated so much that morning with my running figured I would head over to the park to knock out my training for the day. The hike was much tougher than I was used to. According to my Sports-Tracker, the initial part of the hike takes you from an altitude of about 325 feet to 550 ft and just walking that part caught me out of breath and reconsidering my thoughts at a 2nd attempt at the Pikes Peak Ascent which I had attempted (and completed) back in 2008. The thing about Pikes Peak is if you don’t finish in 6 hours then it’s like you were never there. 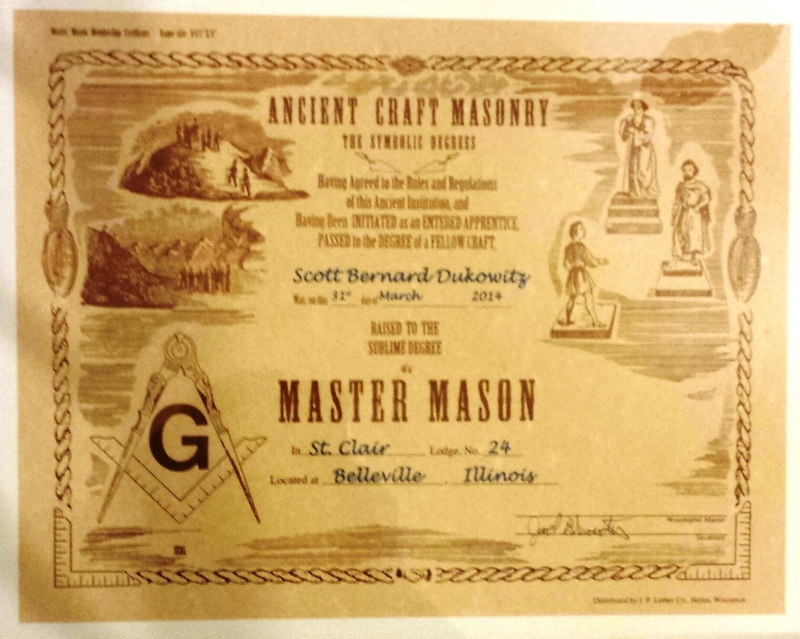 It took me 9 hours but, I finished it, even gave up getting a ride back down to complete it but, that’s another story I’d like to write about sometime. I knocked out my five, 5-minute intervals of running & walking and when I was done w/ those intervals and back on flat ground I added a bonus minute of jogging. Today was pretty decent, I got to a local park before heading to work and did the same 25 minutes of total training. This park (Long Acre Park) has markers every 1/10th of a mile and during the third five minute interval I decided to get a time from mile marker 0.9 to 1.0 and did so in 53 seconds. 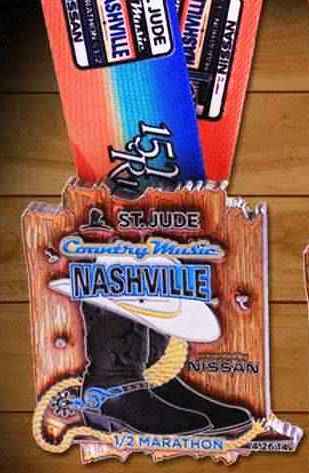 Tomorrow I head up to Nashville, TN for the Country Music Marathon (CMM) aka one of the Rock n Roll (RnR) series events. 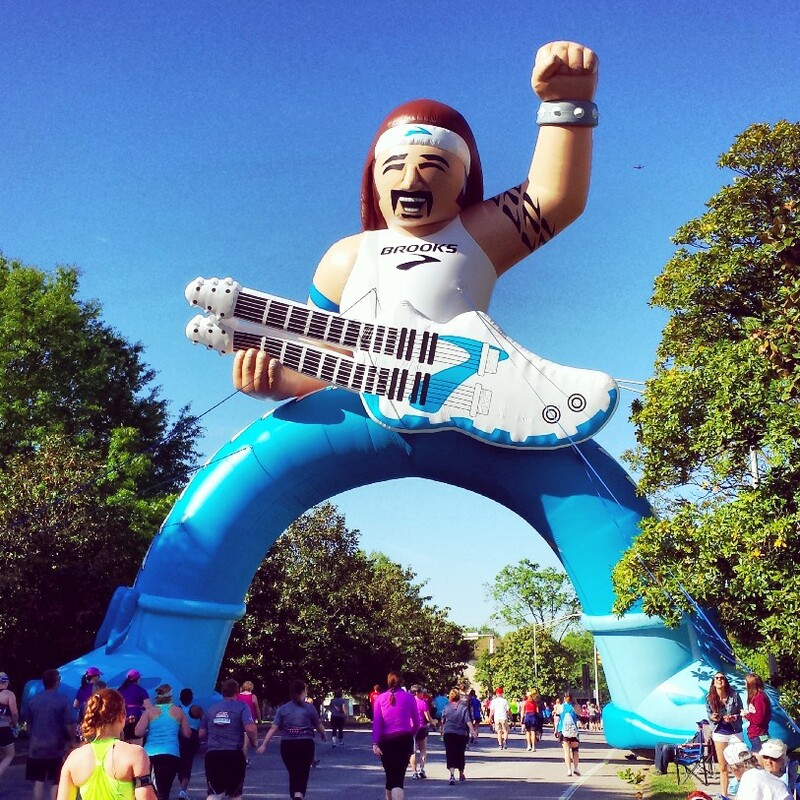 I also signed up for the St Louis Rock n Roll half marathon on October 19th of this year so I’m eligible for one of the RnR Heavy Metals which you can get by running multiple RnR events in a single year. Below is the medal for the CMM and the bonus medal once two RnR events are completed. 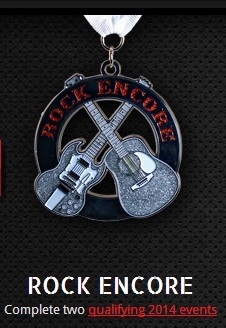 I think I like the Rock Encore medal better 😉 Right now my thoughts are to do 5 minute intervals of running & walking to get through the CMM on Saturday. I did that method in the Lewis & Clark half marathon a number of years ago (maybe 8?) and wound up with a time of 2:40ish. I don’t think I’m in as good of shape currently so I’ll be shooting to beat the time I got earlier this month on April 5th of 3:20. I have pondered my procrastination from yesterday and lack of enthusiasm today. I initially conceded that I just didn’t feel like doing the training which, I suppose may happen from time to time but, there might be some recovery issues as well. When I got home from work today I took a nap and crashed for 4 hours! After a warm up today, there is only 25 minutes worth of training. I don’t think things could get much simpler or take less time. However, the amount of time today’s run has been ruminating around in my head would be measured in hours …basically since I woke up this morning so, maybe 4 hours now. I think it would be good to start developing a habit of running first thing in the morning then I could now have 4 hours worth of accomplishment type thoughts regarding todays running instead of uninformed thoughts about how today’s run might go. I don’t think walking leisurely around the park at an 18 minute per mile pace is going to give me the kinds of results I’m after. These were thoughts I had the other day and part of the reason I pushed myself a bit to hit a 2 minute then a 5 minute non-stop run. If I were a 3 horsepower engine and never demanded more of myself than that then that is all I will ever be. If I start to demand 5 horsepower type of performance then, with adequate rest & nutrition my body will become that 5 horsepower engine. I’m not sure I’ve ever follwed a training program like I’m doing now. I don’t remember the specifics of how I trained 20 years ago. A lot of times I would heap tons of volume into my training programs, fitting in walks whenever I could and maybe getting in up to 6-10 miles a day. I guess what I’m doing now is of higher quality, especially if I push myself to run for longer and longer periods of time and I’m thinking it’s going to be OK to push myself in this manner because my runs are limited, i.e., 25 minutes per run this week and only 4 runs total and never more than two days in a row of running. I suppose I have successfully procrastinated enough this morning that I’ll now need to get to work and will have to hit the park and training at the end of my day. I’ll need to work on this. Below (at the end of the blog) is the training program I am using from MarathonRookie.com. I added the dates out to the left so the end of the program would correspond to the marathon down in Wynne, Arkansas on November 1st. According to the Nike Plus application on my phone, I’ve been active with running/walking for four weeks now and I still have about three weeks before the 26 Week Marathon Training Schedule Below is slated to begin. So, in addition to the 6 months of training listed below, I’ll have close to two additional months of foundational training. 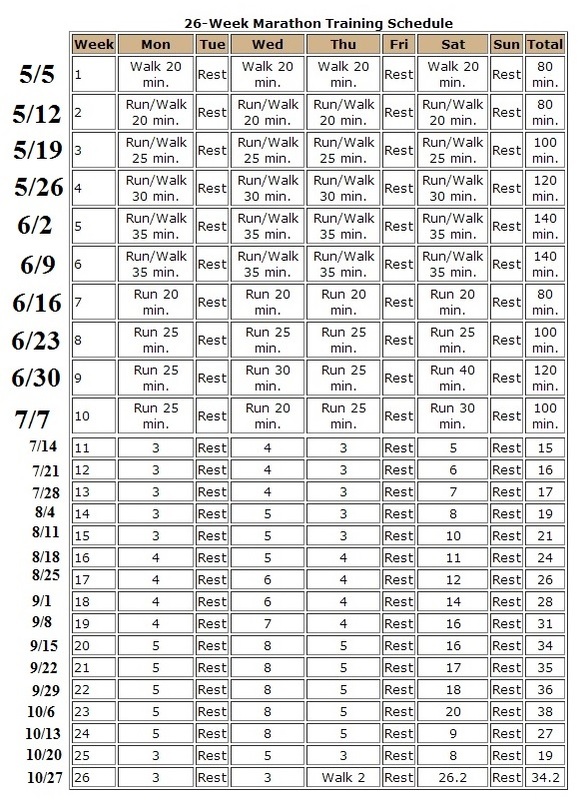 I see three distinct phases in the training program with weeks 1-6 resembling one of those Couch to 5k (c25k) type of programs, then a pure running phase from weeks 7-10, then more specific marathon type training in weeks 11-26 which include the necessary long runs once a week on Saturdays. Any true couch potato I’ve known, including myself, has usually had a great deal of difficulty adhering to any of the traditional c25k programs available so I’ve modified those run walk sessions to consist of 5 minute intervals of running and walking. Last week I did week 2 from the program which called for 20 minutes of Run/Walk so I did four five minute intervals. The first interval I did on the first day consisted of 15 seconds of jogging followed by the balance of the 5 minutes or 4 minutes and 45 seconds of jogging. If there is anyone else reading that is new to running or a beginning again type of person like myself then I’d like to share that the hardest part wasn’t jogging for 15 seconds but was more in the transitional phase of moving from walking to breaking into any type of run. There was almost a type of fear present and wondering if I was going to rupture any ligaments or tendons by breaking into a jog because it had been so long since I had moved my body like that. I took things as gently as I could and was happy that both anterior and posterior cruciate ligaments (ACL & PCL) held together along with everything else in my knee areas. I felt kind of like a cripple during the first interval of running but noticed each subsequent interval of running felt smoother and stronger. I ended up with 45 seconds of straight jogging by the last 5 minute interval. I think the main problem with most of the c25k programs is that they aren’t actually written by any true couch potatoes and I doubt any of them started 2014 out with a weight of 316.2 pounds like I did. As a result these programs can have you running a minute right off the bat with maybe only two minutes of recovery time. I like my 5 minute intervals much better because you can start out jogging with whatever you are capable. If a person can only job 10 seconds that’s fine, just walk the remaining 4 minutes and 50 seconds then repeat the 5 minute interval. This allows plenty of time to recover from whatever you’re able to jog. I did get quite a bit of bonus exercise in last week particularly on Wed, Thur and Friday. Since I’ll be spending most of this year waiting patiently to get my chiropractic license I’ve been taking any odd jobs I can find in order to pay my bills and one job that recently started was cutting lawns. I have a fitbit wrist band I wear which tracks how much I walk each day and I don’t have to have my smartphone with me in order for it to keep track of my miles. I found in the last three days of last week I racked up about 36 miles of walking so I figured close to 30 of those miles was from cutting grass. I was pretty exhausted over the weekend and spent plenty of time sleeping but it seemed to really pay off this week when I started week 3 of the program which consist of five, 5 minute run/walk sessions. After my initial brisk walk warmup on Monday I broke into a run and that lasted 2 minutes and 13 seconds! I know it’s a humble type of time but it was over 100% more than I had done anytime the week before. The truly amazing part was during my last 5 minute run/walk interval I jogged for 5 minutes and 5 seconds – once again doubling my previous best. I was kind of ecstatic over that last interval because I had been wondering over the past few weeks exactly how I was going to end up being able to run 20 minutes straight by week 7 (or June 16th) of the program. Faith & Trust – faith in the program – faith & trusting it will work – faith and trust in myself that I will follow through and stick with the program to even allow it to work in the first place. This is kind of the area were I went off on a bunch of tangents in previous attempts at this blog. A lot of times, especially when I was younger and maybe ended up being disappointed with someone I was in a relationship with I would often end up reflecting internally at myself. Back then, I was able to say that even though someone else disappointed me I would usually conclude that nobody in my life has done more to disappoint me than myself. Just in terms of maybe letting myself down or not living up to my potential. Wasting opportunities and so forth. That usually helped limit the amount of time I would spend imbued on focusing on how someone else may have let me down and, instead could shift the focus to myself and how I could maybe do better with my own life. Anyway, that post collegiate 6 year stint to become a doctor is over now so, like I said, while I’m patiently awaiting a license to practice I think training for this marathon will be a very good endeavor …physically, spiritually and mentally. Faith & Trust. Faith and Trust in the training program but, especially, Faith & Trust in myself and, if need be, I’ll continue to develop and grow those aspects right along side with my endurance.